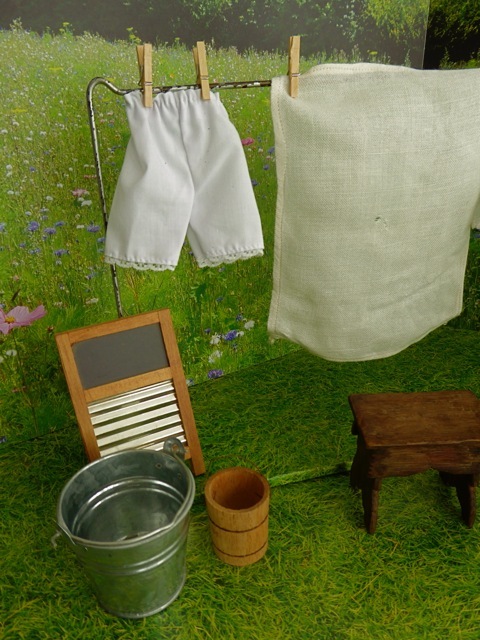 Washing Line: A most unusual piece – it's heavy base has been covered in the same grass-patterned paper as the "floor" of this diorama. The line itself is a U-shaped metal piece, which is inserted into two holes in the base. 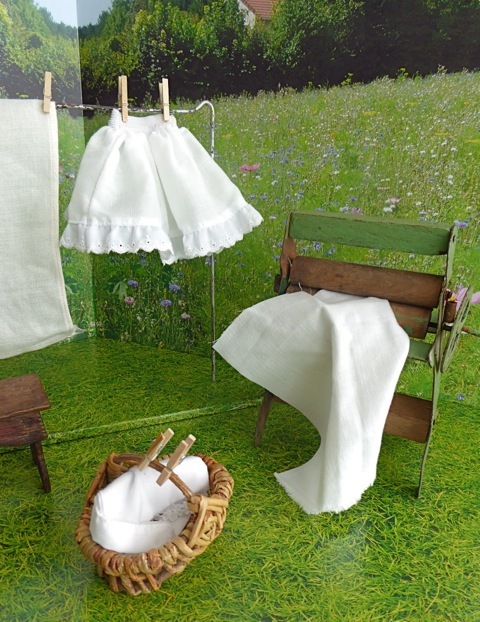 Supplied with 10 clothespins, an antique linen sheet, a full, lace-trimmed petticoat, and lace trimmed bloomers. It stands 20cm/8ins tall. Footstool: A lovely, rustic, antique wooden footstool comes with this set – in case your doll is too short to reach the washing line. 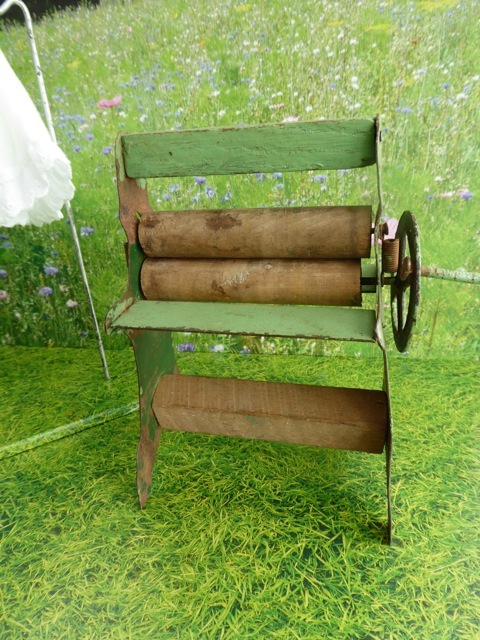 Mangle: This is a rather incredible contraption, used in its time for squeezing the water out of the laundry before hanging it up, whilst smoothing it at the same time. The little handle at the side actually turns the two wooden rollers! Accessories: A beautiful woven basket holds laundry, while two buckets and a replica washboard enable the washing and rinsing to be done. Background: A photograph of a gorgeous flowery field (copyright of GOOD GOLLY MISS DOLLY) has been mounted on two pieces of A3 foam board. Each piece of foam board measures 42 x 29.5cm or 11 5/8 x 16 3/8 in. A piece of foam board covered with grass-patterned paper measuring 49.5 x33cm/ 19.5 x 13in is also included in the price below. Doll: Chosen from our selection of vintage dolls - please see the DOLLS section of this website for a larger choice. Shown here, is a vintage, auburn-haired, Kripplebush Kids doll in one of her original, charming and high-quality outfits. DOLLS: All chosen from our selection of vintage dolls - please see the DOLLS section of our website for a larger choice. Shown here, from left to right are a brunette Kripplebush Kids doll, an Oriental Madame Alexander doll, and a brunette Lesney Ginny. Please note that we always have lots of gorgeous vintage clothes for all 7"-10" dolls.